Can I define a linear gradient in SVG with a normal/bell-shaped blend? Or is it left to the SVG renderer to decide how the colors should be blended together? You can apply a gradientTransform to a linear gradient. I'm not sure how the available transforms map to your required effect. If that doesn't work you can use the gradient as the input to a filter and perhaps end up with a similar effect. Here's an article which covers combining filters. gradientTransform cannot do this kind of transformation. 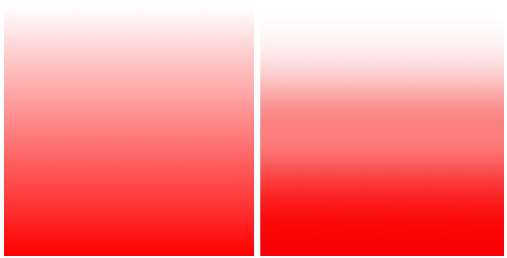 You will need a filter to apply a bell shaped transform to a red/white gradient. Original on the left, transformed on the right. The curve isn't very fine grained (only 15 values), so you would probably want to use more terms for a large gradient. Not the answer you're looking for? Browse other questions tagged graphics svg linear-gradients svg-filters or ask your own question. Can I blend gradients in svg?